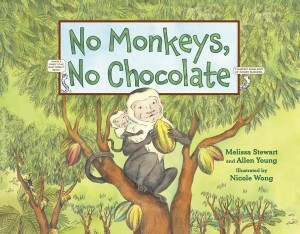 No Monkeys, No Chocolate is a children’s book about the web of life repackaged for a new generation. 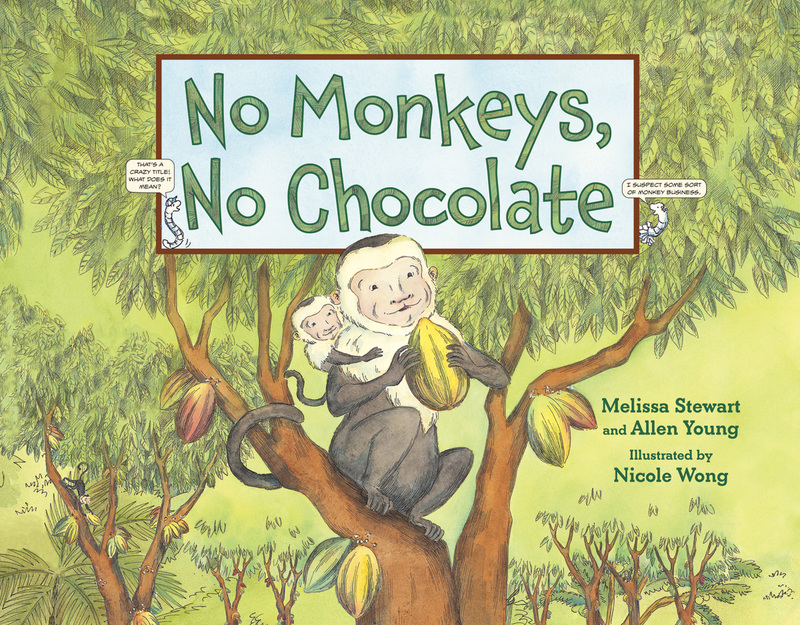 Who wouldn’t want to read about some adorable monkeys and chocolate? Who knew there was even a connection? Authors Melissa Stewart and Allen Young team up to deliver a multi-level story about how we wouldn’t have chocolate if it weren’t for the all the different parts of a plant (cocoa pods, flowers, leaves, stems, roots, and beans) and their use by different animals for food (midges, leaf-cutter ants, coffin flies, aphids, anoles, and, yes, monkeys) who then help to pollinate, distribute seeds, control pests, and other important acts needed to continue the cycle of life and production of cocoa beans! Kids have to hold out until the very last page to find out the monkey’s part in all of this, but they’ll enjoy the journey there. Nicole Wong’s illustrations are colorful, beautiful, and honest. The authors end with a note on current cocoa bean farming which actually produces less crop than in rainforest cocoa groves and also provide a list of what kids can do to help save rainforests. Surprisingly there’s no mention of fair-trade chocolate, a big concern for any ethical consumer. Charlesbridge provided a review copy.